Neelakant mountain and temple visit followed by bath at Rishikesh Triveni Ghat were the main programs for day three. We took the taxi to Neelakant mountain which passes along Gangaji for a few kilometers, to north of Rishikesh. Then we took the new bridge across Gangaji & continued along the same until a small tributary after which we go along with tributary's banks at a good height. Before the construction of the new bridge one had to travel by a longer route (for those going by vehicle) to south of Rishikesh to cross Gangaji. On the path along the tributary one can see lot of tents which serve as camping grounds and also as base for the river rafting trips. 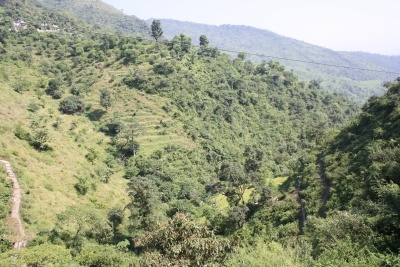 These valleys like the many all over the Shivalik mountains are very scenic and a feast for the eyes and mind. During the trip to the temple, we did not stop to take any photographs. We took the photographs on the way back from the temple. One version of the importance of this location was given us by the taxi driver. Lord Shiva after taking the poison after the "Paar kadal" was churned and holding it in his throat, was returning to his abode. He was very dizzy and is said to have taken some rest at this spot before continuing. Another version given by a temple priest is that a drop of the poison is supposed to have fallen on that mountain & hence the place gains importance. 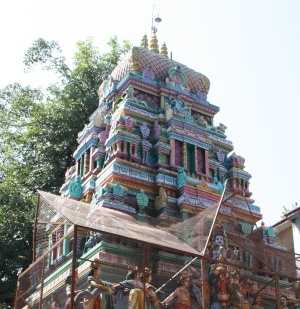 It is interesting to note that the temple gopuram is built in the South Indian style. It seems artisans from South India were taken there to build the temple. This temple is quite small and like in all north Indian temples we can touch the Shiva Lingam and worship. Even though it is small, it is considered sacred and huge crowds seem to come there. Provisions are made for long queues using grills which are placed for 100s of meters. After worshipping and buying some good luck talismans to be given to friends and relatives, we started on drive back to Rishikesh. We took some photographs of the nice valleys of the tributary, the camping resorts and a small cave in the mountain. Later, along the Gangaji we took a few more photographs where the water forms white water conditions and we can hear it gurgling along. 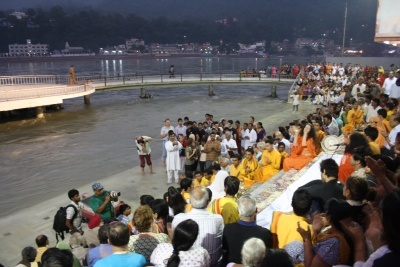 We proceeded to Triveni Ghat in Rishikesh. This is in the heart of Rishikesh and one has to go through the market area to reach it. At times, it seems, the access road is cordoned off, because of traffic jams, as the streets are very narrow. Luckily for us, it was open and we parked near the ghat. We took a quick stroll in the market to look for some souvenirs and did not find anything that we liked. We bought some artificial garlands and a book before heading to the ghat for a dip in Gangaji. In the Triveni Ghat the water was flowing at a level that it exposes a large island of pebble and rock within 15 feet from the steps. The water was also only about a foot deep for us to cross to the island. Beyond the island Gangaji was flowing swiftly, especially in the center. We could venture about 5 to 10 feet into the flowing river beyond which the currents were very fast. All of us took a good dip in the ice cold water. Since it was mid-day it was quite comfortable too and the sun helped us spend a little time with multiple dips. After the bath, we headed to the hotel for lunch and some relaxation in the room. As usual, the wet clothes were washed and hung to dry outside the room and in the room. That day we also planned to take a boat ride across Gangaji near Ram Jhoola. Hence, we left the hotel around 5:30 PM itself (boat rides close by 6 PM) and reached the western shore. We took the motor boat across (which holds about 50-60 people) and landed on the other side. It is amazing to see the boat go at quite an angle to the perpendicular in order to compensate for the fast current and reach the other side just a few meters upstream. On the eastern shore, a sudden decision was made to go for the same Aarthi location that we visited on first day (and on which day we were late), in order to again stand in the nice platform under 6-8 inches of flowing Ganga water. When we reached the place, we found more security and police personnel than the first day. Some film / TV stars seemed to be waiting for someone to arrive and Aarthi had not begun. We quickly left our footwear at the stands and found a suitable spot near the main spot where the microphone had been placed. Bhajans were being sung. After about 5 minutes the Guruji of Paramarth came along with his prime disciples and were welcomed by the VIPs. Then the Guruji took over guiding the rest of the proceedings, including singing bhajans on Hanumanji and Gangaji. Then tens of Aarthi plates were handed out with lit wicks to the crowd and 4 or 5 big gopuram style Aartis were held by Guruji, his main disciples and the VIPs. These have about 50-70 wicks in multiple levels in circular fashion. The overall Aarti scene with so many Aarthi plates are a sight to watch. The reverbration of the song also seemed to boost the energy levels of all the people. After the Aarthi, the Guruji continued with short discourses (1-2 minutes) interspersed with more bhajans. 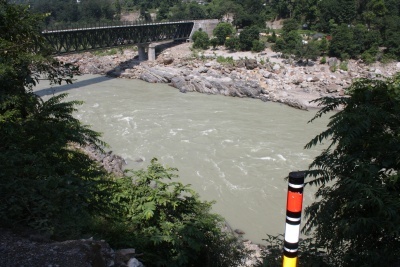 We took a walk in the Gangaji, along with marble platform where it was flowing at 6-8 inches level. Later, we walked along the shops and looked around for things to buy. Finally we ended up buying a lucky charm stone & some kurtas. We also took the walk back along Ram Jhoola, the only way around that area to get back to western banks. It is important to note that from dusk onwards there are bound to be lots of insects. 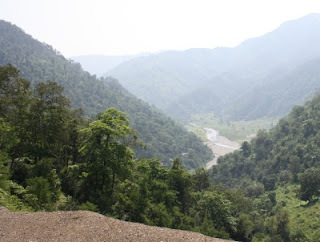 Rishikesh is bordering on the Rajaji National Park and all around the place we have the mountains and forests. Hence, it is advisable to wear full-arm tops and full length pants in order to have a disturbance-free walk around, shopping, visits to temples & mathas, etc. Incidentally, we did not visit any temple in Rishikesh, nor entered into any Mathas. Somehow or other we managed to miss it, in spite of many a guide offering us to show the important spots for 10 or 20 rupees. We wanted our own time to be spent in whatever we wanted to decide on - including the sudden decision to visit the Aarthi or shopping at our whims and fancies. 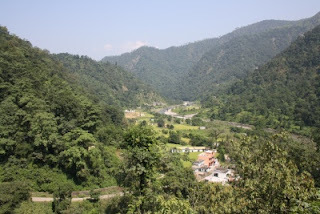 With that we come to end of day-3, when we suddenly decided to go to Dev Prayag instead of Mussourie on the next day. The final decision was again based on not wanting to spend time in long drives with minimal returns. Since our driver said that Dev Prayag is only 75 KM from Rishikesh, we thought it will be nice to see the place where the river starts to be known as Gangaji.